Downtown Durham gets a lot of attention, and for good reason. We don't need to rehash all of the crazy growth in the past few years. 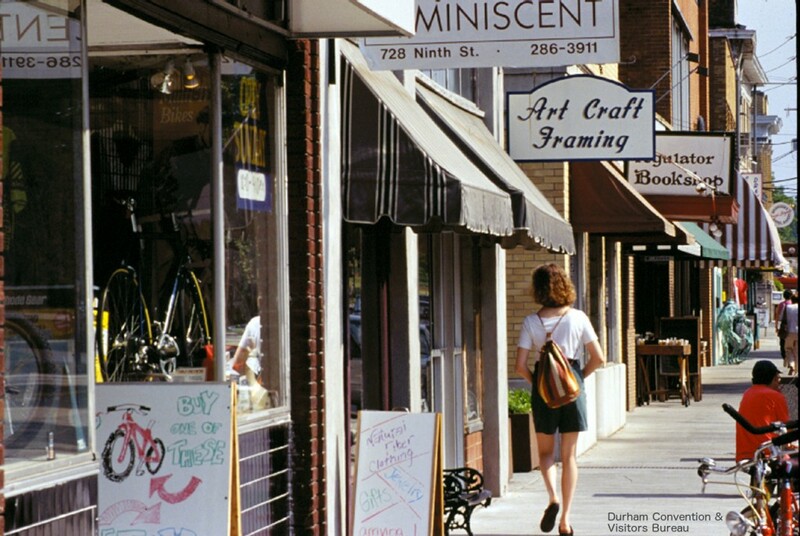 However, Durham has a lot of great neighborhoods outside of downtown that have a lot of potential. 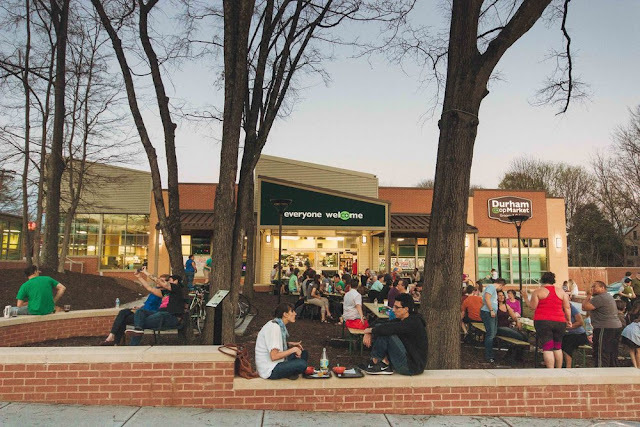 Could other walkable neighborhoods emerge in Durham? I was in Indianapolis a few years ago and was struck by their concerted efforts to create distinct neighborhoods. I was able to visit really interesting, fun areas outside of the city center. Fountain Square is an amazing, artsy neighborhood that features a coffee shop/art gallery, a brewery that doubles as a space for community events, and a cute little intersection that could have been the downtown of a small town in its own right. Broad Ripple was another amazing neighborhood with a completely different personality, but again, could have been Main Street in a small town somewhere else. The city limits of Durham cover a large area. The city takes up about a third of the area of Durham County and 85% of residents of the county live within the city limits. The limits extend well north and south of what we call downtown. I wanted to explore a few neighborhoods in Durham and discuss their potential as a launching point for thinking about this neighborhood model. The 9th street area has been a great neighborhood outside of downtown even before downtown was as compelling as it is today. It has grown and changed. In my opinion, it has trended a bit towards a "shiny/new" look that doesn't seem to fit, but it has managed to keep a lot of its gritty charm at the same time. Regardless, it is a great model for a walkable neighborhood. Could it survive without Duke's East Campus nearby? Doubtful, but it is still a great area for groups of people both affiliated with Duke and not. When I visit Old East Durham, I am always struck by how beautiful the small commercial district is (at the intersection of Angier Ave and S. Driver St). The brick storefronts have such great character and this "downtown" area is charmingly small. However, until recently, there had not been signs of a renaissance for this district. Enter the East Durham Bake Shop (if you haven't had a chance to visit this recent addition to Durham, you should)! Owner Ali Rudel built out a beautiful space right in the center of the small commercial district that could become the anchor for more business activity going forward. The shop provides great food and beverage, but also a great community space. Burch Ave/West End: Recent Growth, More to Come? Somewhere between 9th St and Old East Durham in terms of recent growth, Chapel Hill St west of downtown is anchored by the Durham Co-Op market. It has seen a fast-casual restaurant with rooftop bar, frozen yogurt joint, and coffee shop all open up fairly recently. The co-op has $3 dinners every Thursday with live music that have become a great community event. This area has already become a great, walkable commercial center. However, I think has even more room to grow in the coming years. 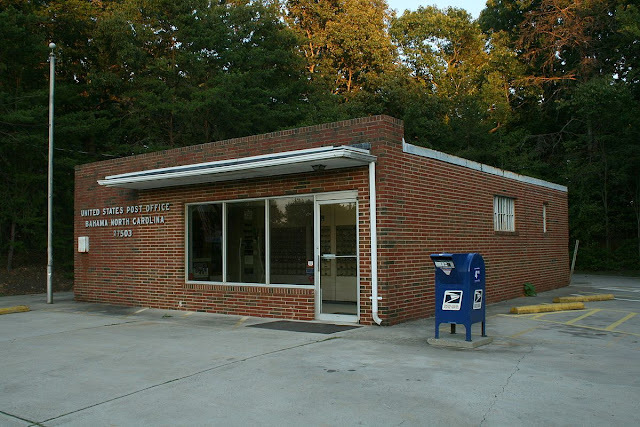 Bahama is an unincorporated community in Durham County. It's pretty and, in stark contrast to the other neighborhoods on this list, not at all urban. 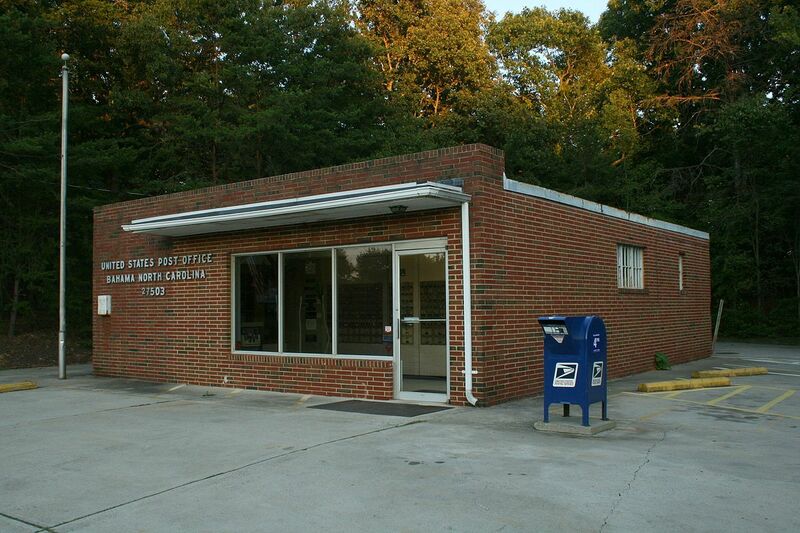 Bahama Rd, near Stagville Road is home to a post office, a convenience store, and a gun shop. Adding just a few more buildings, some sidewalks, and maybe a few landscaping features could turn this into a quaint little town center. As an unincorporated community, this vision is certainly a long shot. Regardless, it's interesting to think about a rural small town center within the Durham County limits that can offer a commercial center completely different from downtown, while developing a strong community. Parkwood (and the greater SoDu area) has had some great additions in the last few years. From sushi burritos to Durham's latest brewery, there is a lot to love about this area. However, it's the opposite of walkable. Parkwood is one example of many Durham neighborhoods that feature large, state roads with strip malls. There is not an easy way to create a true, walkable neighborhood center in these areas as it would require a complete overhaul AND the state-run NCDOT would have to get involved with the roads that they control. Of course, not all neighborhoods have to be extremely walkable. Parkwood can stay as it is and be a great area to live and visit. For the purposes of this thought experiment, Parkwood is representative of many neighborhoods that would be difficult to convert into walkable commercial centers (Watt-Hillandale, Rockwood, Hope Valley, etc). As downtown Durham continues to grow, it will be very interesting to see what happens to the other neighborhoods of the Bull City. What other areas could become walkable centers? In Lakewood/West End, could the commercially zoned old houses on Chapel Hill Rd become a cute center for restaurants, anchored by Lakewood Shopping Center and the new beer barn there? Feel free to leave suggestions for other neighborhoods in the comments! This is such an important thing for so many reasons, not the least of which is that Millennials don't necessarily want to live in apartments but they still want walkability. Thanks Steven! Great additions. Now that Hi-Wire Brewing is coming to the Golden Belt, that area may pick up! Thanks Steven! I didn't see that, but will definitely add it! It's a shame NCDOT destroyed Alston. It could have been an good neighborhood district. I did see that! Very interesting - now with the Lakewood Shopping Center news and this, there seems to be a lot going on in Durham this week!